ARE YOU LOOKING FOR AN OCEAN VIEW CONDO? THIS IS IT!! This beautiful unit is fully remodeled with many extras included. The gourmet kitchen was remodeled with all new Koa cabinets and new appliances. You won't find a nicer kitchen! So much included - spices & condiments. We welcome you to our beautiful HAWAIIAN RETREAT! This condo is our life long dream and we love to share it with others who love Hawaii as much as we do. We are on the 2nd floor (end unit) and have a very large WRAP AROUND LANAI which is surrounded by plumeria trees and swaying palms. Sitting on the lanai in the morning with your fresh Kona coffee or watching the sunset in the evening - you know you are in PARADISE! Our unit is close to the 75' saline HEATED pool and 2 jacuzzis. We have an assigned parking stall and the elevator is near. If you like, golf, this is the place for you. -The WAIKOLOA BEACH and KINGS GOLF COURSE are two of many golf courses close to us. It is an easy 5 to 10 minute walk to a beautiful black and white sand beach at A-Bay! The Vistas are the closest condos to the Hilton Waikoloa Hotel with its Dolphin Quest and free boat rides throughout the resort. On the other side of us is the Waikoloa Marriott which has a great luau on Saturday and Wednesday evenings. All within walking distance! A 5 minute walk takes you to the Kings Shops or the Queen's Market. Great shopping and restaurants can be found there. A great addition to the Queen's Market is a new gourmet grocery store where you'll find a bakery, fresh meats, fish, produce and a wine shop. On Wednesdays you will find a farmer's market at the Kings Shops. This 2 bedroom 2 bath condo has just been freshly redecorated. The beautiful island themed furniture and artwork is pleasing to the eye. You'll enjoy the beautiful tropical area rugs, 2 large Flat Screen smart TVs, BluRay DVD, entertainment center (i-pod ready) and comfortable furniture in the living room. Our new sofa bed has a pillow-top mattress. First class mattresses and linens are provided. We have down blankets on the beds. - We also supply beach towels, boogie boards, a beach umbrella, noodles, beach mats, a rolling cooler and lightweight packable beach chairs for our guests. Our lanai has a dining table, BBQ, a new seating group and overhead fans. The extra large master bedroom has a beautiful four poster bed, entertainment center and a seating area. This room has great ventilation with 3 opening windows and an overhead fan. All windows have plantation shutters. We completely REMODELED THE MASTER BATH in beautiful natural stone. Like walking into a spa with its rain head and handheld shower in the huge walk in shower with a seat. Check out our photos. The beautiful 2nd bedroom has a new queen size bed, an overhead fan and it's own completely remodeled bath. Each bathroom has a hotel style lighted magnifying mirror and hair dryer. You will find a curling iron and flat iron for your use. Our unit has central air-conditioning and overhead fans in the living room, bedrooms, bathrooms, kitchen and lanais. If you are looking for something for a Larger Group, OUR FAMILY OWNS 2 OTHER UNITS AT THE VISTAS - ONE IS RIGHT NEXT DOOR! 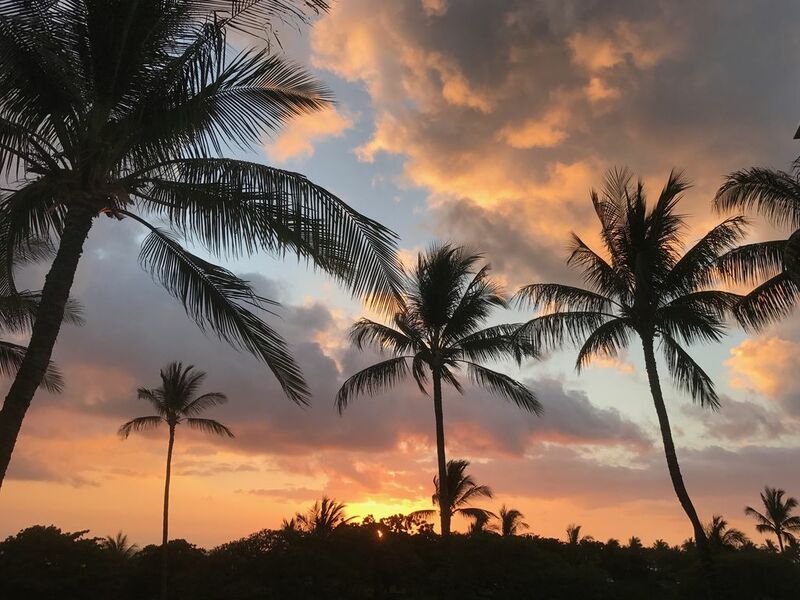 After a day at the beach, golfing or exploring the island you will enjoy returning to your HAWAIIAN PARADISE to watch one of the spectacular sunsets!! Aloha, We are the proud owners of Vista Waikoloa A201. We purchased this condo in 2008 and have spent many hours doing upgrades since we purchased it. We live in Northwest Washington and enjoy traveling to the Big Island as often as we can. We are lucky to have our children and grand children visit us while we are in Hawaii. We also love to share our beautiful condo with others that love the Island as much as we do. THIS IS OUR FAVORITE VACATION SPOT AND IT MAY BECOME YOUR'S TOO! My husband and I have looked at all the resorts in this area and feel that this resort is the BEST! Great construction, great location, beautiful heated saline swimming pool, near the beach, shopping and restaurants. Being from La Conner, WA,, we truly enjoy the great weather in this area! toilet, shower, Newly remodeled - all stone. Central Air Condition - overhead fans in all rooms and on lanai. FREE wireless in our unit. Elevator is convenient to our condo. We have FREE assigned parking. Filtered water and ice in door. New - flat top stove top with a convection oven. Beautiful all Koa wood gourmet kitchen - New high end stainless steel, appliances -Granite counters - -farmhouse sink - Espresso Machine. We include: Hair dryers, curling iron, beach towels, beach chairs, ice chest, noodles, beach mats, beach umbrella and beach toys. Sylvia and Rod's A201 at the Vista Waikoloa is a great place to stay. If you like to cook, this is the unit for you. New appliances and brand name cookware are all provided. The condo is beautifully decorated and spa like master bath is a dream. We like sitting on the lanai in the morning and listening to the birds while we have our coffee. Just magical. Groceries and shopping are a short walk and the location of Vista Waikoloa make traveling to Hilo and Hawi easy. This was the perfect home away from home for us. We came for the Lavaman triathlon and unfortunately I ended up with an injury and couldn't race. This was the perfect place for me to relax and recover in peace - while still being close to all of the action. Our team all stayed at the Hilton Waikoloa making this location PERFECT!! We especially loved having floaties, coolers, snorkels and fins, beach towels and every accessory you could imagine - without having to pack a thing. Thank you so much for the great hospitality. Mahalo! Our stay at this property was fabulous! We've vacationed every year over the last 22 years on the islands of Hawaii and Maui. This is the best place we've stayed on the Big Island in all that time. The decor is calm and beautiful, top of the line kitchen and EVERYTHING we needed was available: snorkel gear, beach chairs, coolers, beach towels, Washer/Dryer, and the kitchen had every cooking tool, serving dish, and kitchen staple you could possibly need. The lanai was wonderful to sit and read on the sofa and chairs while enjoying the weather. It also had a separate space with a 4 person table to eat breakfast in the sunshine and gentle breeze. The 2 bedrooms and baths were great. Loved having the dining room table and chairs as our party of 4 (2 couples age 59-65) are avid board game players. We ended most evenings playing board games and enjoying warm chocolate chip cookies fresh out of the oven! The living room was a nice size and had comfortable seating. The property has a grouping of BBQ's where we cooked a delicious pork loin one night for dinner. The salt water pool and the 2 all tile, in ground jacuzzis were wonderful. Many times we had the pool and jacuzzis to ourselves. Was great to have close parking space. We had a couple of questions while we were there and Sylvia was very quick to respond. We are planning on staying here again in 2019. Stop looking for anywhere else and stay HERE!!! We spent a wonderful week in Sylvia's condo in Waikoloa. Everything looked exactly as the pictures depicted. The kitchen was very well furnished, the bed was large and comfortable, the lanai is amazing, and the location was perfect for our needs. This unit is clearly a labor of love, and we can't thank Sylvia enough for giving us the opportunity to stay there. Mahalo! Aloha Mark, Thanks for choosing our condo for your stay on the Big Island! So glad you enjoyed out condo. It is a pleasure to share with people like you! You are always welcome to return. Beautiful place, but A/C problems really put a damper on our trip. First things first: this is an impeccably decorated, comfortable condo that wants for absolutely nothing, be it beach toys, kitchen appliances, playing cards, books or DVDs; you name it, it's there. And we greatly appreciated the gift of wine, coffee, and mac nuts. Now the bad: Let me start by openly admitting we are air conditioning junkies. We're from Texas, and yeah it gets really hot here, but we're used to blasting A/C and living at a cool 69 degrees. We knew that, coming from some of the cheapest electric rates in the USA to some of the highest, things would be different in Hawaii, and contacting Sylvia ahead of time confirmed it: we would be limited to 75 degrees. That's okay, we could deal with that. Unfortunately, the A/C malfunctioned the entire time we were there. It kept blowing warm air and we would have to turn it off and on again to make it blow cold again. We were up every hour during the night doing that. If not, it quickly got to 84 degrees in the condo thanks to the warm air blowing. I let Sylvia know and she called over her tech, the guy who installed the system. He shrugged his shoulders, saying, "Huh, that's weird, I have no idea but I'm glad it's Friday!" when we told him what was going on. He described what lights were supposed to be on and not blinking, but totally missed the fact that none of the sensor lights were on all! The A/C kept screwing up. Sylvia called over another repairman who said there was nothing he could do; the guy who installed it needed to come back and fix it. So I believe she had the first guy come back out, but we never got an update on that. We had a six night stay. Sylvia offered to let us move after the first three nights, but by that time it would have been a hassle to do so and my husband and I took turns in the night to reboot the A/C so we could get a little more sleep. While I appreciate the fact that Sylvia was on the hook for three separate repair calls, and nobody could figure out the problem, we were on the hook for several nights of no sleep during what was supposed to be a special family vacation. Sylvia was very prompt in responding to my texts, which I greatly appreciated - until I mentioned a credit for our first three nights. There was no response. Ghosted. I asked again and she gave us $50, citing the cost of the repair calls. Underwhelming, but I guess better than nothing. I hate being the lone voice of dissent on the 5* reviews. We are normally very easygoing! Dee, I am sorry to hear that your trip was ruined because of my A/C and you choose to give me 3 stars - Until now, I have had only 5 star Reviews. When you first contacted me regarding the A/C, I offered to let you move to another one of our condos and you turned that down. It is true my A/C repairman was there 3 times during your 6 day stay. Each time he was there, the A/C was working. He said he had no idea why it wasn't working for you. The guests before you and after you have each left raving reviews on my condo. If I had known you were an "Air Conditioning Junky" as you admitted, I would have discouraged you from staying in any of our condos. This condo is our personal vacation home which I take great pride in and I rented it to you at a discounted rate. If the hotel across the street was available, you could have rented a room for at least a third more than what you paid. Checking earlier to see what kind of reviews you left for other VRBO were you have stayed, I was not surprised by the review you left regarding our condo. I am hoping others that read this will feel the same way I do about the review you left for me. Sorry you were so unsatisfied. Fantastic Vacation Destination and Accommodations!! Aloha Greg and Kristen, Thanks so much for leaving such a wonderful review of our property. This condo is our 2nd home and we love to share it with guests like you. We have completely remodeled it since purchasing it 10 years ago and we have put a lot of love, sweat & tears into it. We strive to make our guests happy and it delights me when I hear we have. Thanks for taking such good care of our home. We would always welcome your return. Hope to hear from you again. Close to HELICOPTER TOURS to the volcano - GREAT ZIP LINE & HORSEBACK RIDING within an hour's drive .! We are located between the Waikoloa Hilton and Marriot Hotels. ¼ mile to shopping and restaurants. Hawaii GE & TAT tax number: W95400530-01 Rates are not guaranteed until confirmed.